So the "baby" of our family is 16. He's also 6'2" and still growing. He's smart as a whip, funny in a subversive kind of way, and is so easy going and quiet that I often wonder if he's sleeping with his eyes open. Don't be fooled – this kid can consume a 400-page book in hours, and if he put his mind to it, could probably memorize the Declaration of Independence in one sitting. He's also capable of playing Xbox Live for 36 hours straight without even breaking a sweat, and he plays a mean trombone. In short he's a 21st century Renaissance man, and every day he awes me more and more. Next year his siblings will both be at college and the household will be quite different with an "only child." While Justin's brother and sister can blow up a room with noise and energy the second they enter it, he glides in and out quietly, always observant and rarely calling attention to himself. When he does speak it pays to listen, because it's always interesting and insightful and it feels like you've found a rare jewel because he guards his words so jealously. It's been wonderful watching him grow from a boy to a young man these last couple of years, and I'm really looking forward to the next couple of years as he continues that journey. I think he's going to absolutely blow the doors off of life and I can't wait to see him do it. 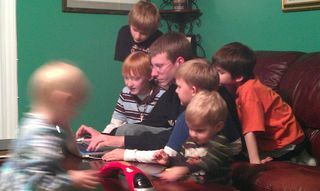 Oh, and did I mention he's a kind of "Kid Whisperer"? Check him out with his young cousin's and our neighbors' boys – truly amazing. This entry was posted in Family and tagged happy birthday justin on May 17, 2012 by Jon Lowder.